Conventional granulators have substantial problems handling long pipes and profiles. To feed large and bulky materials in most cases cavities or platforms are needed. 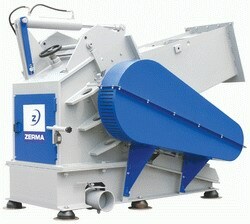 Therefore Zerma developed the GSP range. Thanks to the almost level feeding hopper, long pieces can be fed easily. As the machine there is no risk of blocking, in case of congestion no more material will be accepted by the machine until the grinding chamber is empty and the machine will accept material again, and work can go on without problems again. The GSP range is based on the GS range and all the machine concepts and features that are present in the GS range and leave nothing lacking. The rotor knives are mounted according to the V-cut technology. Contrary to the older cross cut action, the V-cut action conveys material to the centre of the rotor thus avoiding sticking and wear at the side walls. The housing design is divided across the centre line and the hopper part can be opened hydraulically. Easily exchanged wear plates bolted to the side cheeks ensure long life. The screen is held in position by a hinged cradle and is easily accessible. The extremely robust pedestal bearing housings are mounted outside the machine separated from the cutting chamber to prevent dust and dirt ingress into the oversized bearings. This ensures a long life and minimum maintenance.